Above: Protest at White House against coup in Venezuela on July 26, 2019. By John Zangas, DC Media Group. 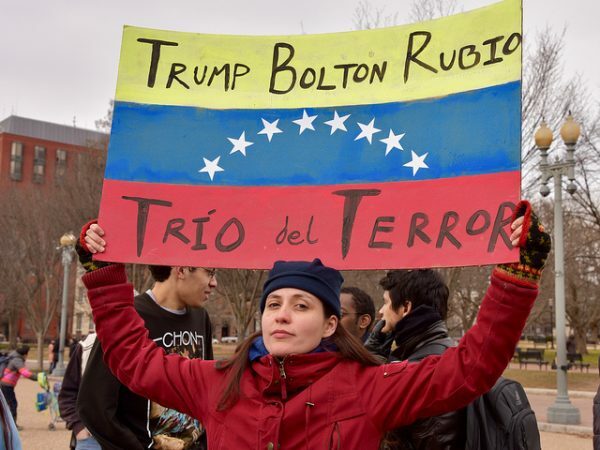 Trump, Bolton, Rubio Trio of Terror. By John Zangas, DC Media Group. Peace groups held a rally at the White House on Saturday to denounce the Trump administration for meddling in Venezuela’s affairs and supporting the overthrow of the democratically elected government of President Nicolás Maduro. On Wednesday, National Assembly leader Juan Guaidó of the extreme right Popular Will Party declared himself the acting president of Venezuela. The United States, in what appeared to be a coordinated action, immediately recognized Guaidó as head of state. Other countries followed in formally recognizing Guaidó, including Canada, the UK, Brazil, Chile, Ecuador and Argentina. Rally speakers accused the U.S. of attempting to foment a coup d’etat and creating a civil war in Venezuela to facilitate a takeover by oligarchs there. The U.S., they said, is not interested in the welfare of Venezuelans but in its oil wealth. Local activist Olivia Burlingame said she didn’t want her taxes going to support the undermining of democracy in Venezuela. She thinks favorably of President Maduro but recognizes that not everyone does. “Regardless of what you think of Maduro, we should respect democracy. If we do it here, we should do it there,” she said. The Trump administration encouraged the opposition to boycott the May 2018 election but then would not recognize Maduro’s win. It has since tried to discredit Maduro’s presidency by calling his re-election illegitimate. Guaidó is now taking the same tactic, said Eugene Puryear, a peace activist with the Party of Socialism and Liberation. “You have to look at the facts,” he said. Some speakers cited Jimmy Carter, who called the election process in Venezuela “the best in the world” out of the 92 countries the Carter Foundation has observed. President Maduro was first elected in 2015. Medea Benjamin, co-founder of CODEPINK! Women for Peace, and expert on foreign policy, said that U.S. meddling in Venezuela was like the Monroe Doctrine of the 1820s when the U.S. did whatever it wanted in Central and South American countries. She said it was strange that some countries in Europe were also supporting the attempt to overthrow Maduro. “You have, quote, ‘democratic’ countries that are supporting the most undemocratic moves of putting somebody in power who was not elected president by anyone–not one person,” said Benjamin. Brian Becker, director of ANSWER Coalition, criticized corporate mainstream media for inaccurate reporting on Venezuela. He compared its coverage to the reporting on the Iraq War, which contributed to a general acceptance of destructive U.S. foreign policy. “The ideas of society are molded by those who have power, and they use the media to shape and mold opinions so they can form to the dominant narrative of the ruling class,” said Becker.